With the 2012 London Summer Olympic Games having officially launched on Friday, I couldn’t help but get caught up in the Olympic fever of watching newscasts and poring over articles celebrating triumphs and sympathizing with defeats. As a Canadian, this is easy to understand as we are still winding down from the feeling of patriotism and excitement that was a national staple for the 2012 Vancouver Winter Olympic Games. But what about those other countries? What about those countries that did not host the Games a couple years back? What about those countries that have never hosted the Games? Are they still as enthusiastic about the whole process and the chance of competing (and winning) on the world stage? The Olympic Committee of Cuba or Comité Olímpico Cubano for those of you that speak Spanish, was formed in 1926 and recognized by the National Olympic Committee (NOC) in 1954. Cuba first participated in the Paris Olympic Games in 1990. They brought home two medals in total; one silver and one gold. Since their first showing on the international stage, Cuba has brought home almost 200 hundred medals, most of which have been gold. At the Summer Games, Cuba is a dominant power in events such as boxing in which they have 32 gold medals and 19 and 12 silver and bronze medals respectively. They are also regular contenders in sports such as track & field, wrestling and judo. New to their list of Olympic successes however is baseball. Baseball has been a symbol of pride for the people since the 19th century, and enjoys immense popularity with the locals second only to their love of amateur boxing. Baseball however, though unofficially a part of the Games in 1904, was not accepted as an official Olympic sport until 1992. It was then that the International Olympic Committee (IOC) granted it medal status, allowing qualifying teams to compete in an eight team tournament that consisted of a round robin, semi-finals and finals. All players were required to be amateurs until the 2000 Sydney Summer Games which was first to allow professional players. Since it became an Olympic event, the Cuban team has risen to the top of the sport and become a force to be reckoned with. With the event only having been held five times, Cuba has medaled each and every year with gold finishes in 1992, 1996 and 2004, and silver finishes in 2000 and 2008. Baseball is a great pastime for the people of Cuba. You can always find a pick-up game going on in the streets, junior leagues competing at the local park, and at least a handful of locals willing to debate the greatest players, athletic feats of greatness and memorable moments. Interested in playing with Cuban baseball players on your next trip to Cuba? They’d be happy to have you. Contact International Career Studies to find out more. From 1957 to 1989, elephants in Thailand were primarily used in the logging industry. They were domesticated and trained by local villagers to work and provide the family with an income. By the end of 1989, the logging industry had grown so rapidly that the forests had been depleted to a point where only 20 percent of the forests remained forcing the government to ban the trade. With the logging industry effectively shut down, many Thai families found themselves without a source of income, a situation made worse by the fact that they were still in possession of a very large animal with a very large appetite. Some owners turned to illegal logging near Burma, while other mahouts train their animals to give rides to tourists or roam the city streets begging for money. 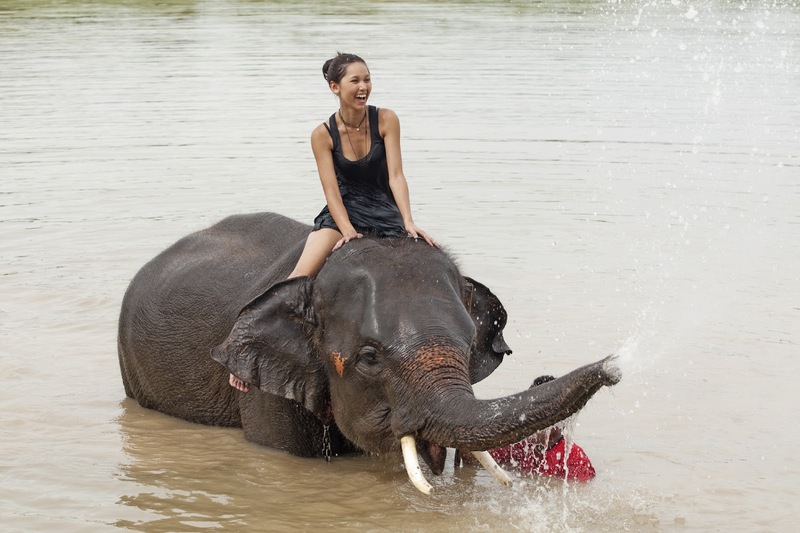 The lucky elephants however end up on reserves like the Elephant Nature Park in Chiang Mai, Thailand where they join a herd of domesticated animals, roam at will and enjoy leisurely baths down at the river with their mahout. Unfortunately, despite the government’s ban on logging, the forests of Thailand are still slowly being depleted. There is little natural habit left for elephants and only 5 percent of Thailand’s elephant population remains wild. That is why the work the volunteers are doing at the Elephant Nature Park is so important. In addition to providing a sanctuary for the elephants, food and nutrition, veterinary care, mental stimulation and a family environment, they also provide educational resources for guests and volunteers. This is not just another “get your chance to ride an elephant” program. Conservation and raising awareness of the elephants’ situation is a vital part of what the nature park is about. They invite tourists from around the world to come and interact with the elephants first hand. Participants in this edutourism program can choose to volunteer for one or two weeks and be taught by the mahouts on staff about elephants, their habitat, herbal medicines, conservation efforts, and how they can help to save this endangered species. Edutourism programs, such as the volunteer positions at the elephant park in Chiang Mai, are ideal for people and groups that want to get more out of their travels than a few photographs. The programs are designed to be engaging, educational and informative; providing an experience and unique insight into another culture, another activity and even another social political issue such as the conservation of an endangered species. If you are interested in participating in an edutourism program with elephants in Thailand, contact International Career Studies for more information. Unpaid Internships: Why Should I Bother? It is a universal truth that internships are a great stepping stone for young graduates seeking to get a foothold into the working world. Internship positions provide basic, entry level positions with plenty of supervision, a variety of tasks, and consistent training to help shape your classroom education into something useful. Internships provide work experience and no resume is complete without work experience no matter what private school you went to. However, the sad fact of the matter is that many internship positions today don’t pay. Of course, that depends greatly upon what industry you are going into and the type of company you are working for but the truth remains that you are participating in an internship because you need work experience and are often at the mercy of the employer. Choosing to participate in an internship therefore often conflicts with the need to meet certain financial obligations that many young students are faced with such as bills and school loan payments. For some, not earning money in exchange for work is not an option they can live with and that is completely understandable. However, if this is your case, I urge you not to write off the unpaid internship just yet. Why should you bother with an unpaid internship position? You need the work experience. Currently, you have no experience that relates to your industry no matter how carefully you word your stint flipping burgers at the local fast food joint. Even entry level positions these days require previous work experience and so not stepping up to the plate means your resume is going to be left in a scrap paper bin. You might not be able to afford to go three months without an income. But if no one will hire you based on lack of work experience, can you really afford long term not to? Unpaid internship positions mean less competition for the spot. Paid positions are few and far between and when they do come along, you can bet that they will be swamped with applications numbering in the hundreds. Even with a stellar education, it can be hard to stand out. You might not get called, you might not get selected and then you will be stuck waiting around for the next paid internship to become available. Unpaid positions, while still competitive to get, are great in number and more diverse meaning instead of competing against hundreds for the primo spot, you might only have to stand-out among a handful. Employers are often more flexible. If you land a paid internship position, be prepared to treat it as a 40 plus hour per week job that includes the occasional evening and weekend. After all, they are paying you and therefore expect you to be available. With an unpaid internship, employers understand that you need to have some sort of an income to pay your bills. They will often allow you to customize your schedule to accommodate a part-time job. Maybe you only come in three days a week, or maybe you just work mornings. This flexibility will allow you to gain the workplace experience and networking opportunities you need and hold down a second job that will pay the bills. You are getting paid. You may not be receiving any financial compensation in the traditional sense of a paycheck, but you are getting paid. You are being paid for your work with experience, the chance to network, the opportunity to learn from industry professionals, the long term financial gain of landing a high paying entry level position, etc. As long as you are willing to embrace the definition of “payment” that extends beyond money, it is easy to see how even with an unpaid internship, there are significant gains and a return on your invested time. There are many great internship positions available out there. Don’t be turned off of the idea just because you see it as a financial black hole. If you are interested in participating in an internship, consider contacting International Career Studies to see if they have an internship that suits your interests. For more internship related reading check out Internships Equal Jobs; Simple Math Anyone Can Do and Internship Attitudes You Need to Ditch. Perhaps this blog topic is just a marketing scheme to get people to consider taking a trip or perhaps it is inspired by the fact that as I write this I am sitting on a dock, drink in one hand and computer on my lap, watching the sun go down while I feel more relaxed than I have in months. The fact remains however that work related stress and burnout affect a large percentage of our population and the tried-and-true method for dealing with these feelings is to simply take a break. Everyone needs a vacation. Employers are under no legal obligation to provide workers with a light at the end of the tunnel also known as “vacation days”, paid or unpaid, whether you work on a salary basis, commission or get paid an hourly wage. Yet many companies offer employees vacation days and holiday time and this isn’t just to lure you in like a moth to a flame and trick you into accepting their job offering. Studies and doctors agree that taking the occasional vacation is actually good for your mental and physical health. There have been strong links found between vacation time and longevity. According to the Framingham Heart Study research project, people who go on vacation just once a year decrease their risk factors for heart disease by a whopping 20%. Aside from the direct health benefits; time away can also improve your leadership skills and will help put your work in perspective. Companies realize that rested employees with outlets for their stress and time off are healthier overall and become stronger assets to the business with better problem solving skills and creative, cost saving solutions. In fact, some companies even demand that their employees use the available time off. Case in point: I was recently at a point where I had gone almost a year without taking a vacation and my employer started sending me not so subtle e-mails reminding me how many days I had available. And now that I have spent eight days sitting in the sun down by the water with a book and sunscreen, doing absolutely nothing work related, I find myself more focused on the task at the hand. And despite the pile of work I know will be sitting on my desk and the flood of e-mails that await me upon return, I know that I can handle it and approach it in a less frantic and stress free manner while still meeting my deadlines and exceeding the company’s expectations. Everyone needs a vacation now and again, whether you go to Thailand and ride elephants or go to your cottage and blame the bad cell phone reception for not being able to check your voicemail. Your work will wait, your company will survive without you, and you will return more relaxed, focused and healthier than you were prior to your trip. And if your employer hesitates, just tell them that it is per doctor’s orders.